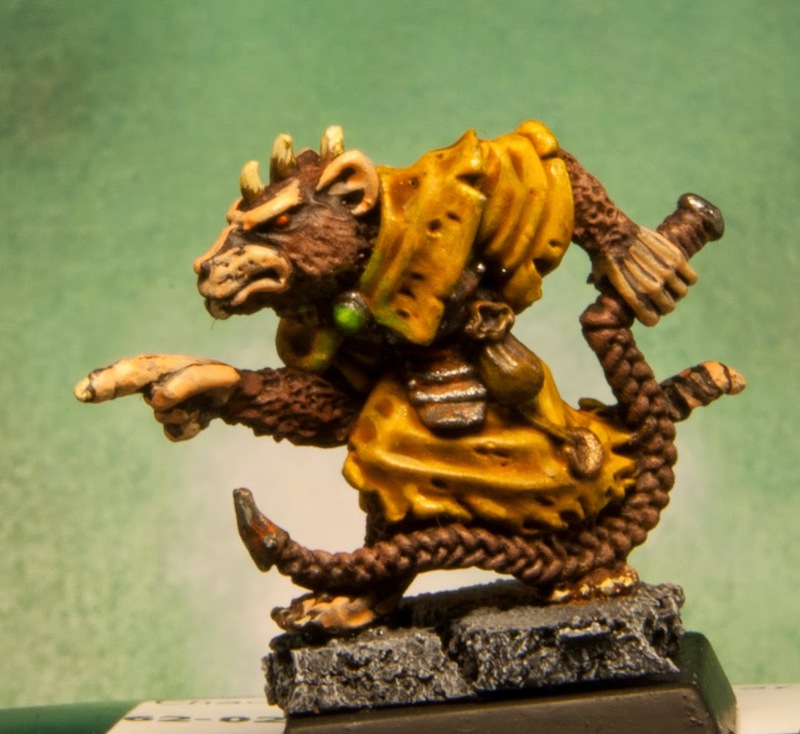 I have finally finished painting my very first unit for the Skaven army. 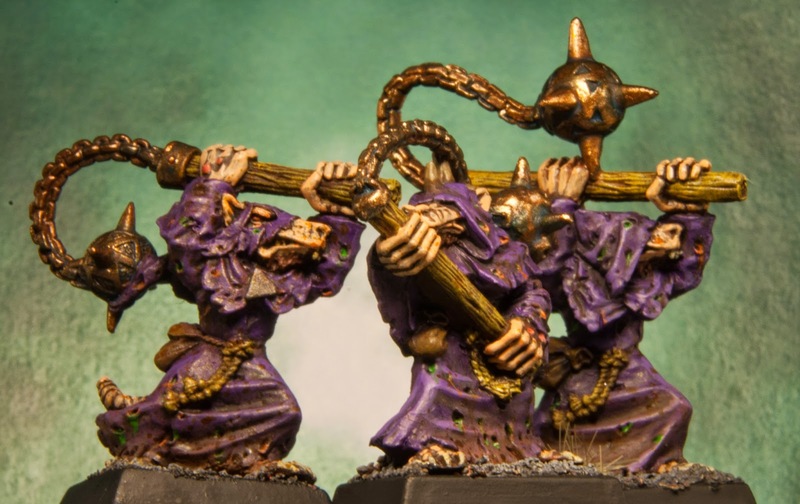 I have chosen sick purple as a color for the tunics and dark bronze for the censers. On top of that I managed to finish a Vermin Lord, a Packmaster and to retouch the previous hero so that it is a bit darker and not so shiny. 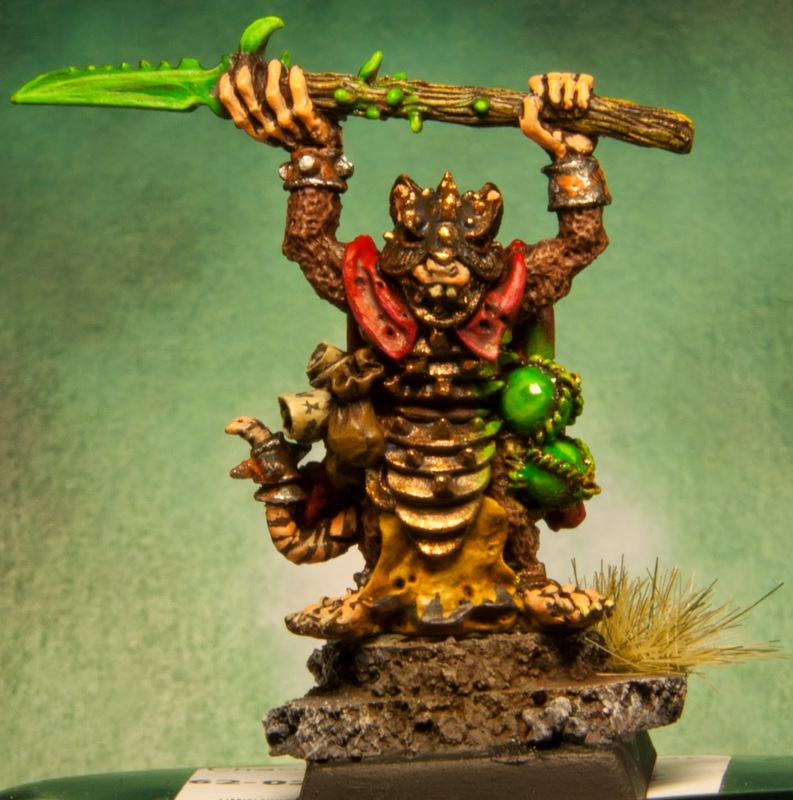 I spent a little bit of extra time on the vermin lord to make some glow effects as well as painting more details in the clothing. 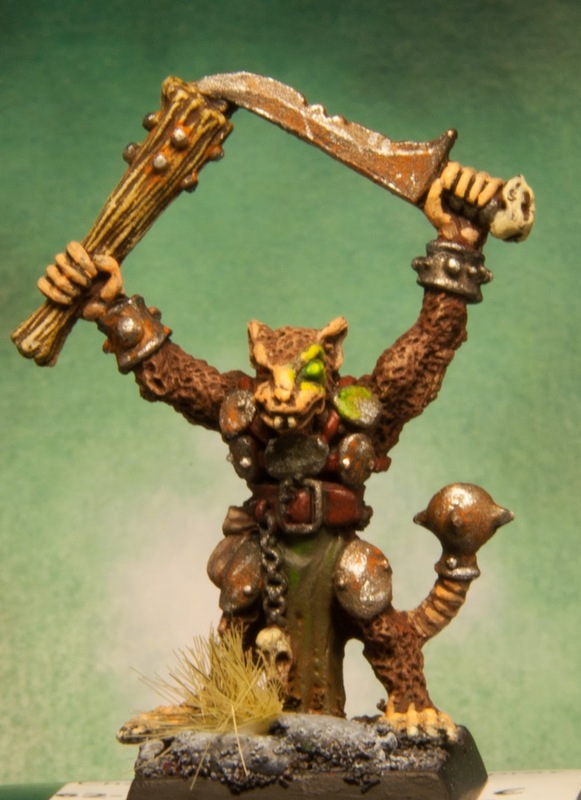 Instead of using metals for the halberd, I painted it green warpstone, after all, he is a Vermin Lord so I expect he will carry a magic weapon! I hope you like them as much as I had fun painting them. I am quite satisfied with the shiny effect on the poison wind globes. They were coated with several layers of shiny varnish. Since he is not particularly tall with the extra help of the big base he can now tower over the troops. I know it is not easy to spot, but I darkened some of the tones compared to the previous post. Very simple but hopefully effective paint job for the Packmaster. As you may have noticed, the bases for the Vermin Lord and the Packmaster are different compared to the ones used for the troops. I am planning to use special bases for all heroes, lords and for some of the elite troops. I am still not sure if I should use the same kind of base for all models or just keep on with this idea of special bases for the heroes and elites. I would like to hear your opinion on that! Meanwhile I am sharing here the recipe on how to make these bases, in case somebody finds it helpful. I started by breaking out some irregular pieces of cork out of a 5mm cork sheet. Then I glued them to the base with white glue for wood. After that I painted one thick layer of Vallejo's oxid paste which gives a very nice rock texture. 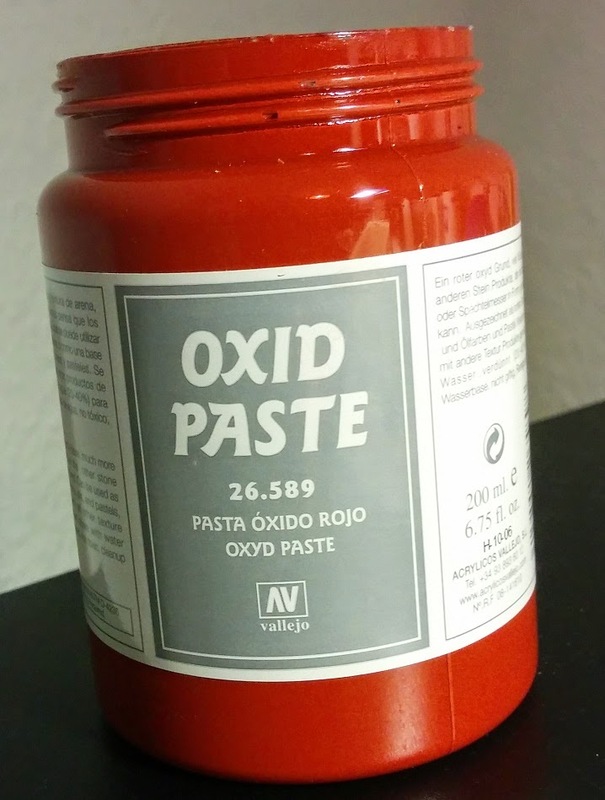 I also use this same oxid paste to all regular bases. As a final touch I added some gravel in some parts of it, no need to add additional glue as the gravel will stick to the oxid paste. 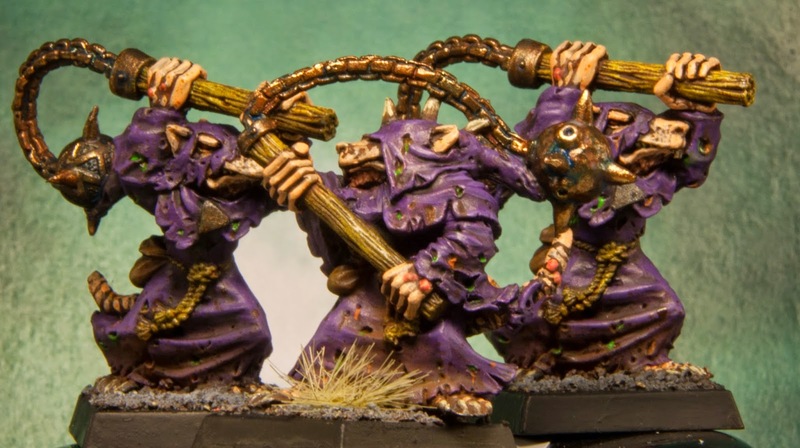 Only thing left is paint them with several grey drybrush layers and glue the skaven to it. To do that I remove the tag from the figure and pin it. Most useful paste for applying texture to bases ever. All figures painted in 2015.